How can you mix economics with spirituality? If spirituality is real to you, how can you not mix it with everything else in your life? As spirituality is a fast-rising trend, PROUT views the integration of spirituality with all other aspects of life as an essential future human trend. It was certainly not the intention of Karl Marx, but his materialistic philosophy produced a brutal monstrosity instead of a compassionate human society. The socio-political and economic dynamics of communism led to general standstill and immense suffering in all countries where it was imposed on people. By denouncing spiritual values of life, it seems that communism left out life altogether. Among all the values, the spiritual aspect produces the most optimism, inspiration and dynamics. 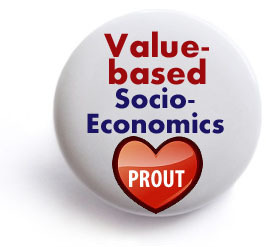 Society should therefore integrate socio-economics with spiritual values as much as possible. Spiritual values in the form of “lived” morality offer the best hedge against corruption and other maladies that have made socio-economics, politics and cultural life rot under capitalism.